After a 2-week work trip in San Francisco, I was ready for a little land travel in Panama. We planned to be in Golfito, Costa Rica, where we could leave the boat for a long weekend and visit Philippe’s Uncle Earl, Aunt Mayra, and cousin, Josh. We intended to take the bus to the Costa Rica boarder town, Paso Canoas, but while waiting at the bus stop a number of taxis stopped and asked if we wanted a ride. We turned the first few down, but eventually decided it might be worth it if we haggled a bit. Philippe wound up negotiating for what we felt was a fair rate, and we enjoyed the private 50-minute, air conditioned taxi ride (a cruising friend, by contrast, wound up on a hot, packed bus where his wallet was stolen from his pocket). 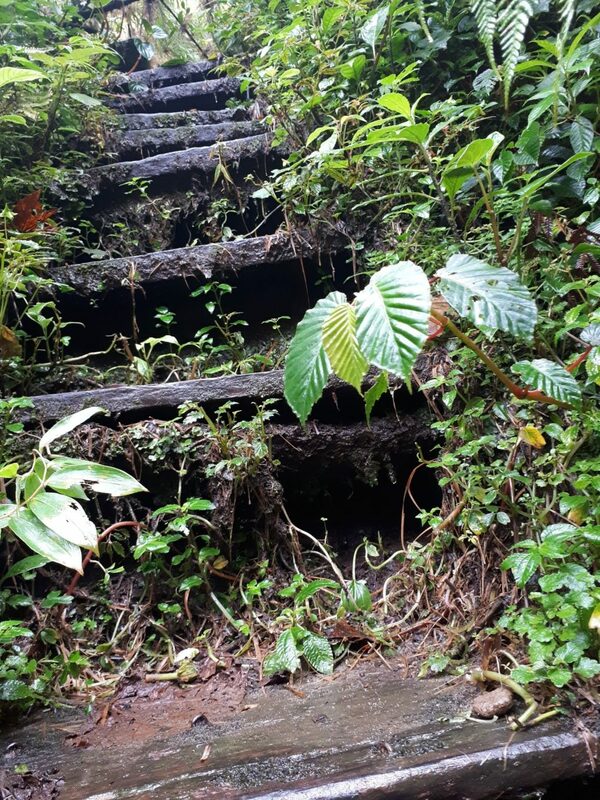 Checking out of Costa Rica and into Panama isn’t particularly straightforward, but with the help of a few detailed blogs we were able to navigate the two sides of the border and check into Panama in the pouring rain. 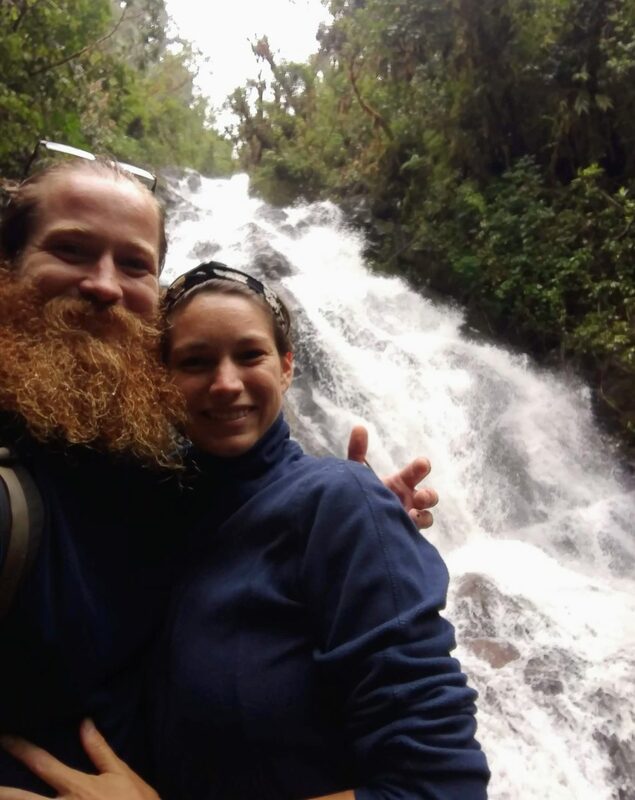 We had a lovely visit in Volcan with Earl, Mayra, and Josh. It was so fun to catch up with family, and their Panama home is beautiful. 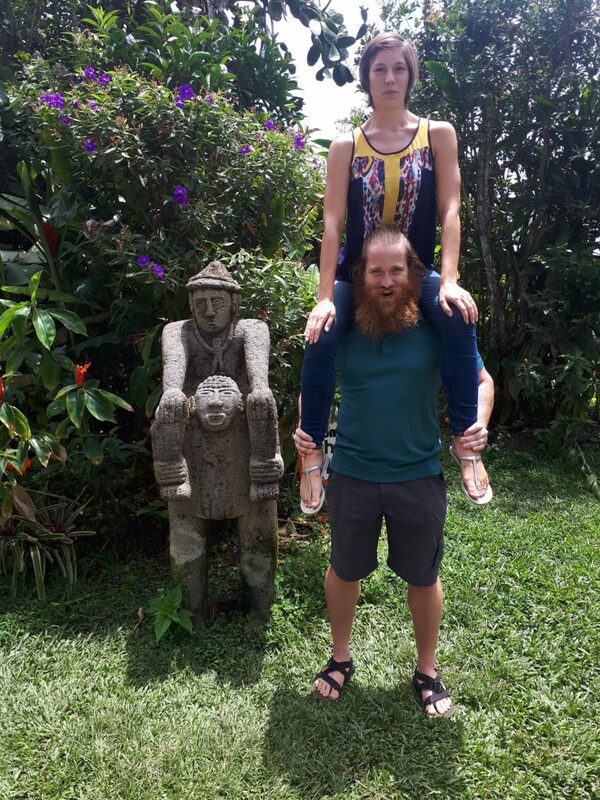 Our first full day in town, Philippe and I headed to El Parque International de Amistad, which spans the Panama/Costa Rica boarder. The trail was extremely muddy (it is rainy season, after all), but we lucked out with our morning weather. 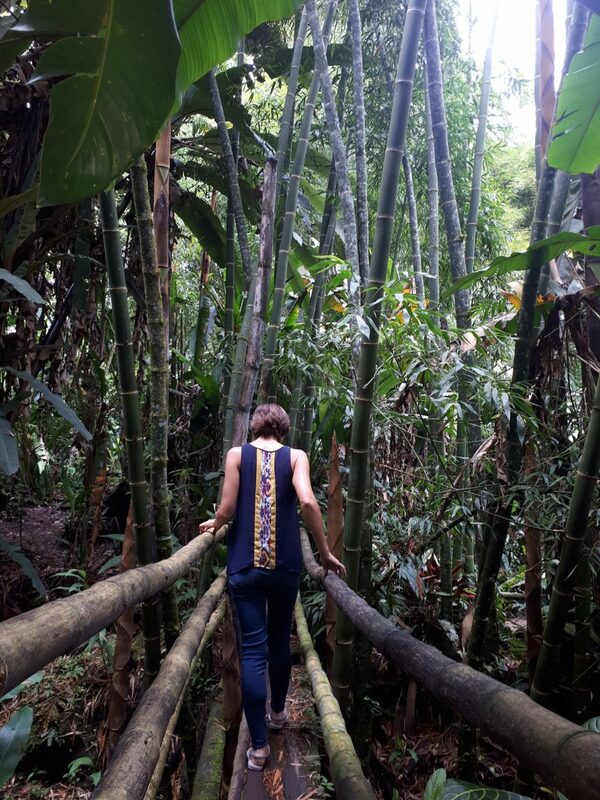 The hike was spectacular – lush vegetation, mountains, waterfalls, and streams gave us lots to explore. Hiking trail in the international park. Everything is covered in moss and vegetation in the rainforest. Check out the view from this overlook! It was a little overcast on our hike in, but when we came back out we did have a view of the other mountainside. The highlight of the hike was the waterfall at the end. The falls were huge and we we had them all to ourselves. It was a little too cold to swim in the pool, but we spent some time climbing over the rocks and enjoying the view. The wet boots were totally worth it! We made it to the waterfall. We had it all to ourselves, and even though it got a little cold, it was spectacular. I’m touching it! We brought our bathing suits, but it was far too cold to swim. Philippe and I have always wanted to see a tapir. 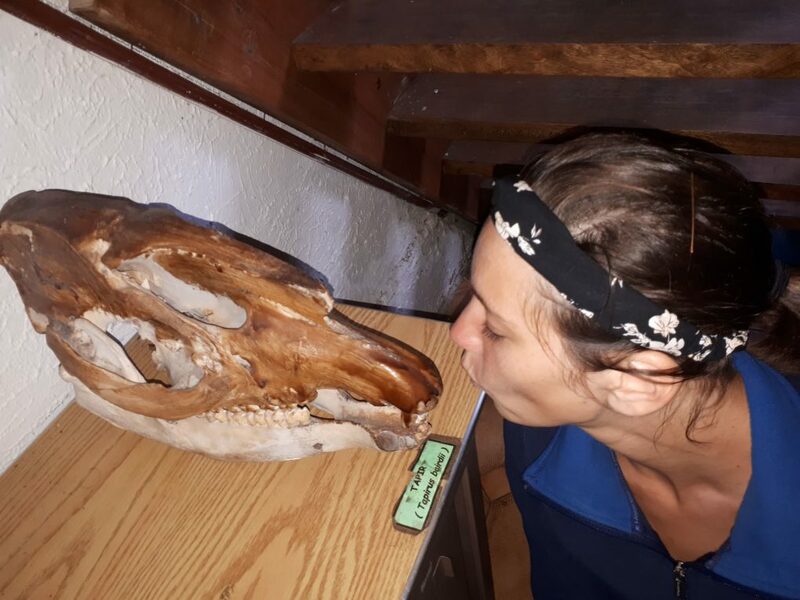 No luck yet, but at least we got to see a tapir skull. The next day we explored Volcan with Earl, Mayra, and Josh. 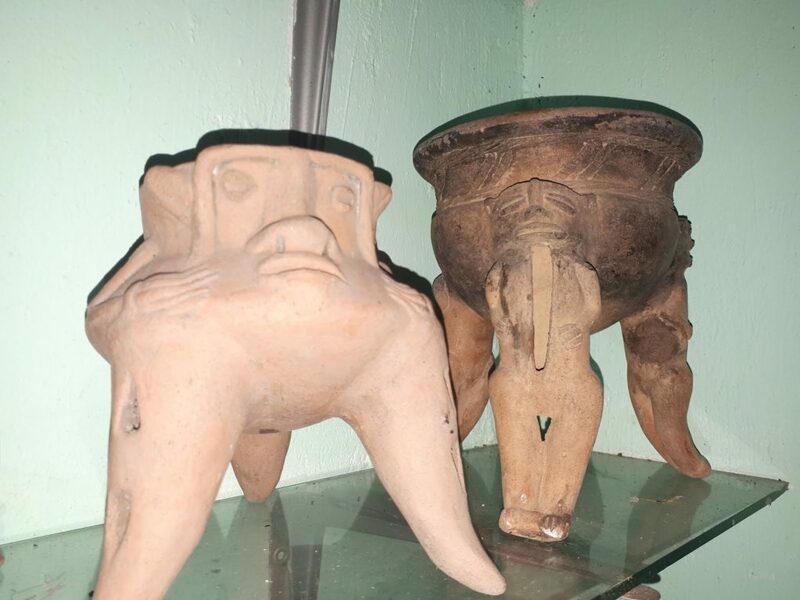 We visited El Sitio Barriles Museum, where some families and a university professor had excavated local pottery and artifacts. The property was owned by a wonderful woman, Edna, who gave us a surprise tour. Her family had lived on the property since she was a child, and she was carrying on the legacy and really trying to build a foundation for ongoing education. The detail in some of the artifacts was amazing! After the museum, we headed to the Janson Coffee Farm, where we skipped a tour but enjoyed coffee made with locally grown beans on a deck overlooking the countryside. What a way to spend a weekend!